Lon Fender was involved in some biggest business deals in the Wiregrass and in the history of Ray City. 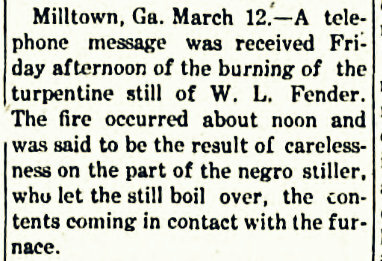 Born William Alonzo Fender, he was a son of William Alfred Fender (1836-1920) and Susannah Allen (1841-1920), who became residents of Ray City in their senior years. Lon Fender himself owned farmland near Ray City in the 1920s. 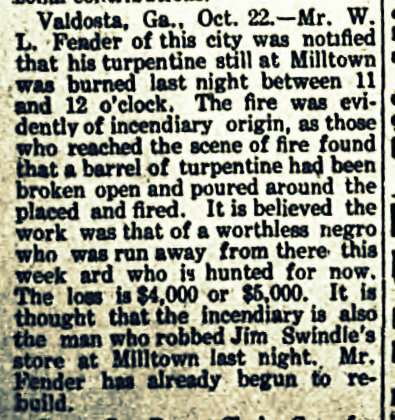 Another account published in the Waycross Journal described the losses as “the turpentine still of W. L. Fender, with 35 barrels of spirits, and 100 barrels of rosin…destroyed by fire.” The Journal further indicated that the robbery referred to occurred west of Milltown on the Georgia & Florida Railroad, making it likely that the actual scene of the robbery was Jim Swindle’s store at Ray’s Mill, GA.